A Swede Grove Townhship farmer was the first to take advantage of a new Meeker County program that loans money to dairy farmers who want to expand or improve their businesses. Greg Jans, co-owner of CoJo Dairy, located about 10 miles south of Lake Koronis, recently built a new dry cow barn for his dairy facility, using $75,000 in low-interest loan money from the county. The new barn should help increase milk production at CoJo by improving herd health while also reducing the amount of work in caring for the dry cows. Greg Jans, co-owner of CoJo Dairy in Swede Grove Township, Meeker County, used a new Meeker County loan program to build a new 15,000 sq. ft. free-stall barn for dry heifers. The loan program that CoJo used to help finance his dry cow barn is administered by the Meeker County Development Corporation. The loan program provides revolving low-interest loan money to Meeker County dairy producers to help pay for upgrades to facilities, barns, or equipment. The program can provide up to $75,000 per farmer for dairy improvements, according Joe Egge, executive director of the Meeker County Development Corporation. The interest rate for this loan program should range between two and four percent, said Egge. Matching funds, usually from commercial lenders, must finance a portion of the project, he added. Investing loan proceeds in the health of dry cows was important for CoJo, said Jans, who farms in partnership with his son. Of the farm's 500 dairy heifiers, about 100 are dry at any given time due either to being pregnant, to resting and waiting to breed, or to being too young to breed yet. Even though the dry period is relatively short - only about a month and a half per year or five months total during a heifer's three-year milk-producing cycle - it is a crucial period for determining future production, said Jans. "A heifer's dry period is the most important part of her whole laction," said Jans. "It gets her in condition for the next lactation." CoJo's investment in a new 15,000-sq. 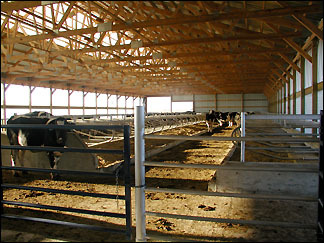 ft. structure provides a clean, dry area for heifers to live when they are out of the producing herd. It also includes a calving area where pregnant cows can be monitored before, during, and after calving. The free-stall barn is less than 50 yards from the main barn and opens to a 13-acre pasture, where the heifers are free to graze when the weather is nice. Before building the new barn, CoJo housed their dry heifers a few miles from their main farm, which made it difficult to keep track of them, Jans said. Now his herd is nearby, healthier because their new home is easier to keep clean, and easier to monitor because it is so close. The workload was decreased because nobody needs to travel several miles to feed the dry cows or to check on pregnant heifers or young calves. Now that time can be spent better on other areas of the farm. Reducing workloads may be a key to keeping more small dairy operators in business. According to Jans, more small dairy farmers have quit recently because of the workload than because of low milk prices. Even though CoJo Dairy is a larger dairy operation, Jans supports small dairy farms because he knows that these operations make up the vast majority of the area's dairy producers. Local dairy operators are afraid that big dairy producers will run them out of business, said Jans, when in fact a small dairy can still be profitable if it is managed correctly. To do so, attention needs to be paid to increasing production without increasing the workload, he stressed. Change can be hard for some farmers, but it is still important, said Jans. Meeker County's loan program could make it possible for small producers to improve their dairy operations while keeping money in the community, he said. Keeping money in the community is important to Jans. The farm has been in his family since 1960, and he estimated the family has spent more than $2.5 million locally since then. He likes that Meeker County loan money, which comes primarily from a federal grant, will go to Meeker County farmers, who will in turn spend their money at local businesses. Everyone wins this way, he said. Because the loan money must be matched with money from commercial lenders (usually 50-50), even local banks should benefit from the program, agreed Egge. In addition, because the Meeker County Development Corporation's requirements for equity are less stringent than most commercial lenders, more farmers could be able to take advantage of the opportunity. Jans hopes more farmers will. The goal of the Meeker County loan program is to help keep farmers in the community, said Egge. In addition to money for dairy expansion, funds are also available for other businesses, including agri-business and manufacturing. Most Meeker County Development Corporation loans require that the recipient create jobs, said Egge, an added bonus to the community. Farm loans, however, are exempt from the employee requirement. Jans wasn't required to add employees, but he hopes the added production from his healthier herd may allow him to add another position to his staff, which already includes two full-time and seven part-time employees. Jans still plans to add a manure lagoon, using the proceeds from his loan from the county. When he is finished, he estimated he will have spent about $240,000 in improvements. The Meeker County program is possible because of federal grant money made available by legislation authored by Rep. Dean Urdahl (R-Grove City), said Egge.The program should make dairy farmers more competitive, he added. For more information about the loan program for dairy expansion or other loan programs, contact Egge at 320-693-5272.